May 9, 2009 - Thirty years of skiing "the highway"
Pica Peak from Kangaroo Col, May 9, 2009. In the spring of 1976, I climbed Silver Star Mountain for the first time, approaching the peak on snowshoes.� The North Cascades Highway had been open less than four years, and I was 19 years old.� Two years later, I skied across the highway in winter with my brothers Gordy and Carl.� (A story about that trip can be found on my website.) 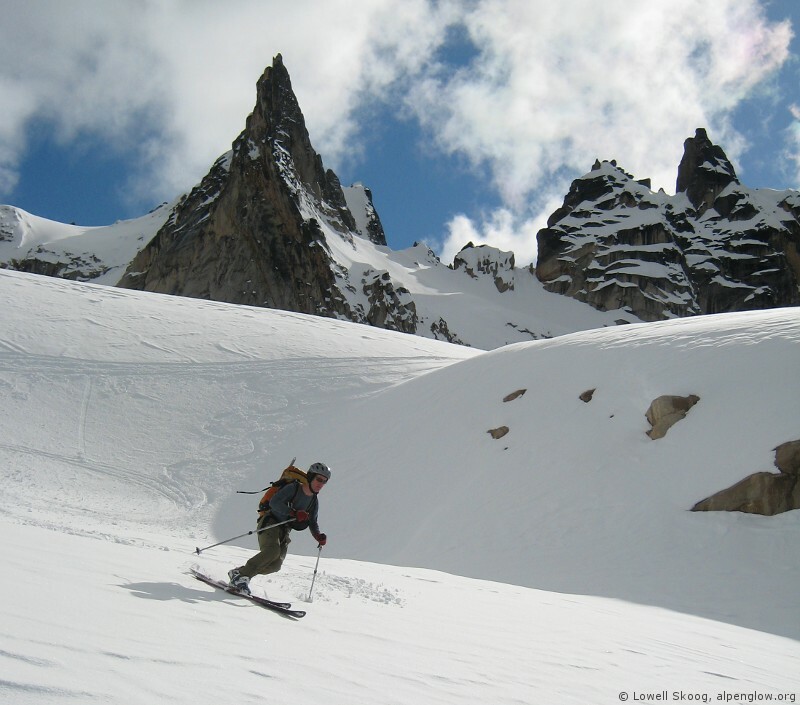 We used light cross-country skis for the highway crossing, and I decided I needed to find sturdier gear for real backcountry skiing.� I soon bought a pair of Ramer bindings and mounted them on a pair of old K2s for skiing with climbing boots.� I tried them for the first time on a ski ascent of Silver Star in April 1979.� It was my first ski mountaineering trip, and I enjoyed it so much that I returned to Silver Star nearly every spring for the next twenty years. 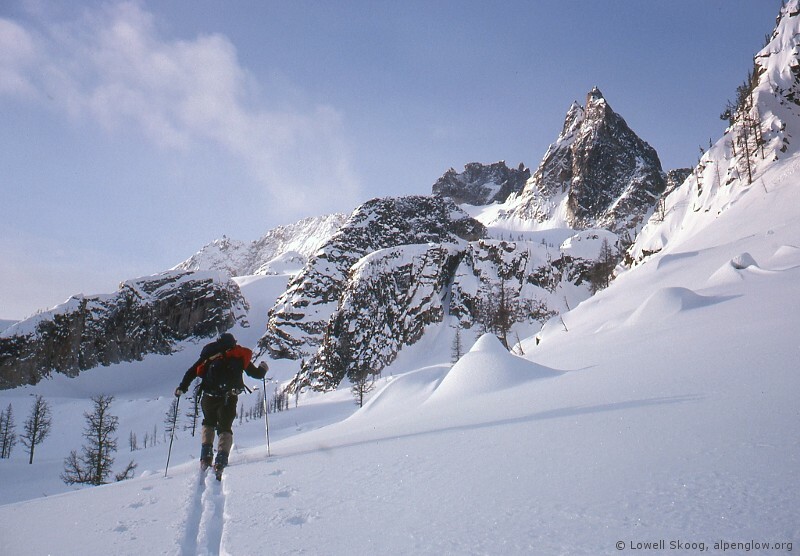 As the years passed, I realized how lucky we were to start backcountry skiing right after the North Cascades highway opened.� In the early 1980s, it was rare to see any other skiers along the highway.� That has changed in recent years, but every spring I seem to find another great tour up there that I've never done before.� �Like many "old-timers," I feel that I've lived through the Good Old Days.� But I realize that we're still living them.� (This is something I was too clueless to understand when I was younger.) Everybody who skis along the highway today is a part of a golden age of discovery. Thumbnails (click to enlarge). Left: April 1979 - Gordy Skoog, Eric Lindahl, and Gary Brill on Vasiliki Ridge. 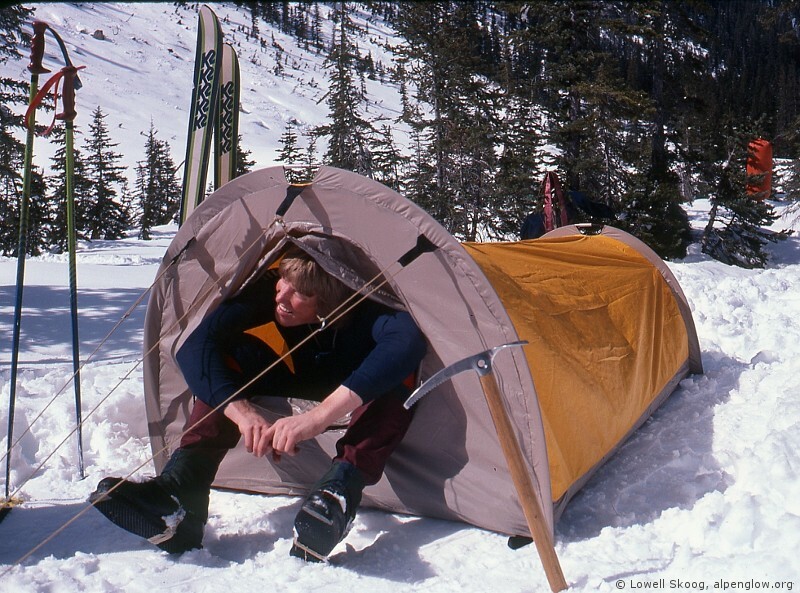 Center: Gordy tests my homemade Gore-Tex "Incompotent," inspired by Early Winters' much-hyped Omnipotent.� (Check out Gordy's 1960s-vintage leather ski boots! 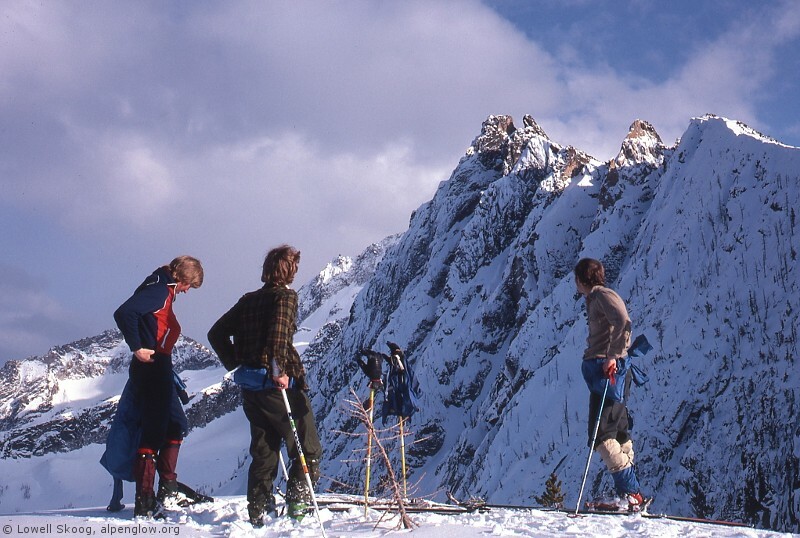 )� Right: Gary climbs toward the summit during my first ski climb of Silver Star Mountain in 1979. I found further evidence of this yesterday.� Five of us made vague plans to ski near Washington Pass.� We figured we should go east to avoid the deep snow that fell last week in the western Cascades.� Tim was interested in a tour that could include an ascent of Big Snagtooth.� I was curious about Kangaroo Ridge, having done little skiing in that area.� John, Ross and Matt each had his own preference.� We ultimately decided to tour from the hairpin toward Snagtooth Ridge, figuring we'd work out the details along the way. We ran into Oyvind's group near Kangaroo Col.� Matt remarked that in his four trips to Kangaroo Ridge, he's never seen another skier before.� Our group reached Big Snagtooth first, but we were not equipped to tackle the verglassed rock in the approach gully.� We backed off and let Oyvind's group take a shot at it.� Matt had to get home early, so after our attempt on the peak he and Tim returned the way we came.� John and Ross had never been up Silver Star Mountain, so the three of us decided to traverse over the peak on skis. 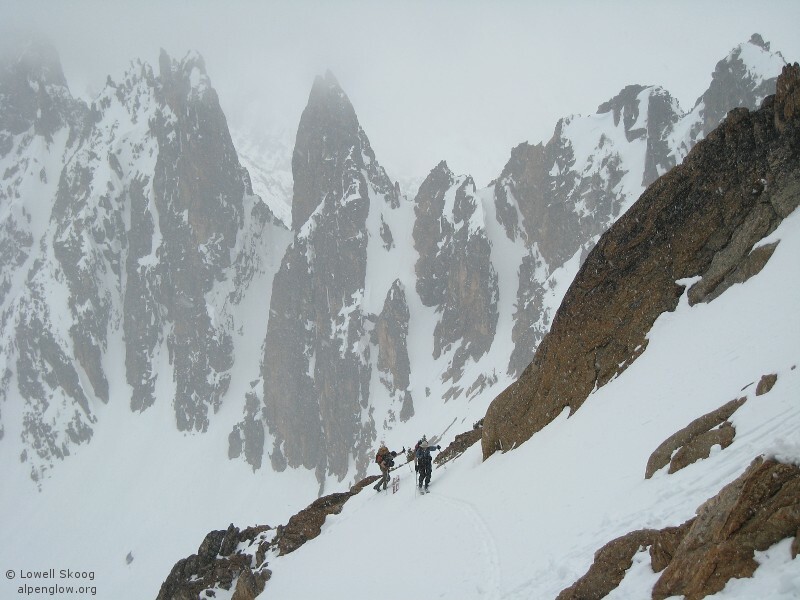 Ross Freeman and John Mauro ascend the south gully of Silver Star Mountain with Snagtooth Ridge in the background. From the southeast shoulder of Big Snagtooth, we skied into the east basin and traversed toward Silver Star.� We passed over a minor spur, then started skinning up gullies and ramps toward the col between the east and west summits.� A narrow spot forced us to make a short, tricky scramble over snow covered slabs.� But the rest of the ascent went entirely on skis.� Clouds enveloped the peak, and light snow fell during most of the climb. From the col we scrambled up the east (true) summit.� Remarkably, the clouds broke during our climb and we had great views.� We returned to the col and followed recent ski tracks down the glacier to Silver Star Creek.� The last mile to the highway was on foot, but the transition from snow to dirt went pretty smoothly.� At the highway we met a snowboarder waiting for his party to descend.� He gave me a ride back to the hairpin to retrieve my car. 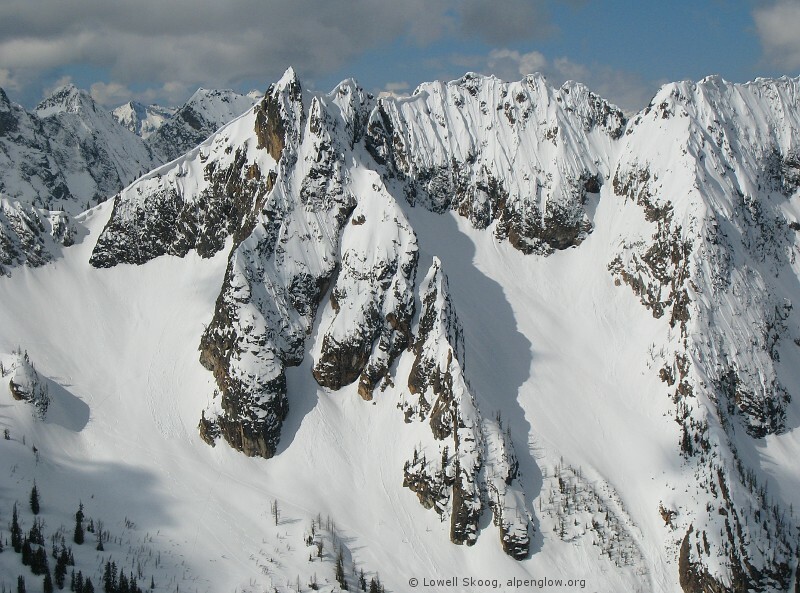 Once again, the North Cascades highway served up a great day in the mountains.� I realized during the trip that thirty years have passed since my first ski mountaineering trip on Silver Star Mountain.� We're lucky to live in such a wonderful part of the world. John Mauro skis Silver Star Mountain, May 9, 2009. Re: May 9, 2009 - Thirty years of skiing "the highway"
...Last time I was up there I also ran into Oyvind's group. Love those classic, old pics. Nice TR, Lowell. Love the old-time perspective -- though people of our age are much too young to be 'old timers.' And, as always, the Skoog photos rock. ... We're lucky to live in such a wonderful part of the world. And we are equally fortunate in having Lowell to pioneer and document. nice story and awesome pix .... as a newbie wanna be ... this gives me great perspective on the sport ... thx! 30 years of any one thing is an achievement; time flys while your having fun! As noted, I love the old shots. TR and the photos are Skoogtacular! In addition to being such a wonderful place, with such great memories for so many of us, I wonder if Silver Star also holds the record for being the place where more of us have wandered off course on the approach (self included) than any other popular tour in our region. - thanks for the first account history! any highway, in or by the mountains, is a great thing. I put the rpt. on Tioga Pass highway (CA 120 ) last wkend !